Double Din Facias / Kits. Single Din Facias / Kits. CAR SECURITY / PARKING SENSORS. Ford ST / RS Parts. Focus 1.0/1.6 Ecoboost. INDUCTION KITS / AIR FILTERS. HID Kits / Performance Bulbs. R8 / Devil Eye / DRL Headlight. 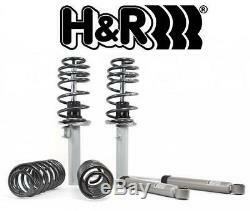 H&R Cup Suspension Lowering Kit VW Golf Mk2 inc GTi 8v 16v 60/40mm 31015-1. Fed up with coilover kits? Want to retain ride quality but don't want a coilover kit? Then H&R Cup Suspension kits are for you! Designed to fit the following vehicles&##xA0. Volkswagen VW Golf Mk2 all hatchback models inc GTi 8v / 16v. Designed to lower the vehicle up to&##xA0. Kit comes complete with 4 shock and 4 springs (Picture shown for example only). Please note that the figures shown for lowering are'upto' figures, cars with factory fitted'sports' suspension may not lower as much. H&R Sport Cup Kit Extreme lowering with a nice ride Sport Cup Kits have all the features of the Touring Cup Kits, plus additional lowering&###x2014;perfect for the enthusiast looking for a little more. The progressive spring rate design retains superior ride comfort. With more than 2.0 inches of lowering, the H&R Sport Cup Kit is the ideal solution for those who desire a suspension application engineered for the street with a super-low, performance stance. The ultimate spring and shock system. More than just a &###x201C;matched&###x201D; spring and shock package, H&R Cup Kits are the result of over 25 years experience in suspension design. Because H&R Cup Kits consist of specially made springs and shocks&###x2013;designed and engineered together&###x2013;they provide optimal suspension damping and better control. H&R Cup Kits make a cohesive suspension package that outperforms and is more comfortable than separate off-the-shelf performance suspension components. Designed and produced in H&R&###x2019;s ISO certified manufacturing facility in Germany, H&R Cup Kits are 100% German-made. Sorry we do not accept American Express. We specifically disclaim any implied warranties of title, merchantability, fitness for a particular purpose and non-infringement. Customers should satisfy themselves that any item choice made is suitable for their intended purpose or use. We cannot be held responsible if the product is not suitable for use outside the UK. Therefore we reserve the right that if you have ordered the item incorrectly or no longer want the item we will at our discretion minus the following amounts (based on normal mainland UK addresses, non mainland and non UK maybe more) : Items sent by Post - &###xC2;&###xA3;2.95 Items sent by Recorded Post - &###xC2;&###xA3;4.95 Items sent by courier 1kg to 10kg - &###xC2;&###xA3;6.95 Items sent by courier OVER 10kg - &###xC2;&###xA3;9.95. This listing is currently undergoing maintenance, we apologise for any inconvenience caused. The item "H&R Cup Suspension Lowering Kit VW Golf Mk2 inc GTi 8v 16v 60/40mm 31015-1" is in sale since Wednesday, March 26, 2014. This item is in the category "Vehicle Parts & Accessories\Car Tuning & Styling\Performance Suspension\Performance Suspension Kits". The seller is "rudiemods" and is located in SOUTH WOODHAM FERRERS. This item can be shipped to all countries in Europe.